“Individuals who go through gray divorce are considerably economically disadvantaged, and they are a growing demographic group,” Brown said. She estimates nearly 650,000 people over 50 were involved in divorces in 2010 alone. Couples who marry and remain married have a big financial advantage, because they’re able to share their resources and split their expenses, making them much better off than single people who carry the full burden of mortgages, rents and living expenses for years or decades. New research indicates that divorce, by effectively throwing many baby boomers back into the disadvantaged singles category, causes their personal financial status to deteriorate at just the wrong time – around retirement. One study tracking baby boomers’ wealth back to 1985 found “large negative financial consequences” for those who divorce at some point in their lives. The typical divorced boomer had 77 percent less wealth – home value plus financial and retirement assets minus mortgage and other debts – than in the years prior to divorcing. 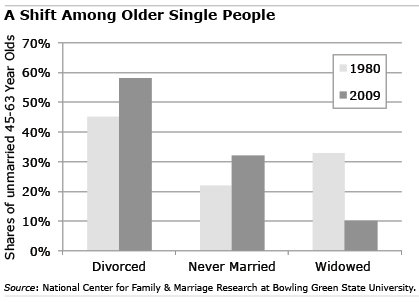 Poverty falls harder on divorced women than men, according to Brown’s new research, which used a survey of older Americans to compare poverty rates for people with various “marital biographies,” including never married, divorced, and remarried after divorce.